Today is the 150th anniversary of the beginning of the Civil War. As a kid, moreso as a teenager, I had a very focused interest on World War II. I remember that my grandparents had a set of World War II encyclopedias that dated back to the 50s. I would grab them from the bookcase they were in and look at them obsessively. I read nonfiction books on the war that I bought at the local drugstore. Bantam paperbacks were my favorite. Every month, they seemed to have a new book out by a veteran about their corner of the global conflict. I devoured so many of them. By contrast, the Civil War held very little interest. When my mother and I lived in Delaware, my class took a field trip to Pea Patch Island, a small dot of land located in the middle of the Delaware River. It was a Union fort during the war, and held Confederate prisoners. It is marked in my memory as a cold, dark place. The old prison cells were cast in impenetrable shadows, the walls covered with slime. I couldn't imagine anyone staying in them. There wasn't much to see there by the time I had arrived. The highlight of my visit was a stop at the gift store, where I was able to purchase a couple ceramic figurines--a Union officer and soldier. I wasn't at all interested in any Confederate troops. After all, they were the bad guys, fighting to keep a race of people enslaved, and they were rightfully the losers. Until presently, that was probably the peak of my interest in the war. Apart from a children's book which told the story of the battle of Gettysburg, and contained the full text of Lincoln's address, I had nothing else regarding that period in history. The identification with the moral stance of the North made sense to my childish outlook. That never changed, however. I still feel strongly about it. It boggles my mind how a vast section of the country could've fought and shed so much blood over such an inherently evil institution as slavery. PBS recently replayed Ken Burns' documentary about the war. I watched much of it with renewed curiosity as the anniversary approached. It's scary to think how many victories the South tallied up in the first few years. 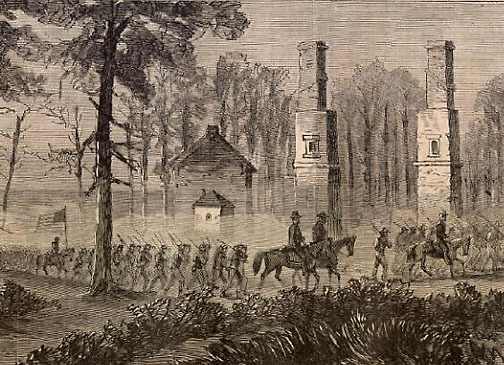 As Lincoln struggled to find a general who could properly wield the Union armies, which in many battles outnumbered the Rebels, he despaired of ever gaining the upper hand. The pivotal fight of the war, Gettysburg, was exactly what the North needed at the time. Robert E. Lee's air of invincibility had been shattered, and the tide at last began to turn, though it wouldn't be the end of Confederate victories. It wasn't clear that the North had the war sewn up until at least late 1864. As Burns' epic account wound to a close, I couldn't help but feel immense righteousness and vindication in Sherman's march to the sea. He left a trail of destruction unparalleled on this continent, while the hugely diminished Rebel armies bounced off his flanks like flies. After reaching Savannah, he turned north towards South Carolina, where the fever of secession had been born. His troops' wrath was multiplied there. Speaking of his men, he said, “The whole army is burning with an insatiable desire to wreak violence upon South Carolina. I almost tremble for her fate.” Whenever I thought about what the South was fighting for, and the enthusiasm with which it set about fighting, thinking some God was on its side, I could feel the desire that those Union soldiers must've felt. Ironically, southerners who like to make themselves feel better often refer to the conflict as the "War of Northern Aggression," when it was actually the South who fired the first shot. Even today, many in the south try to re-characterize the war as a battle for states rights. But this has always been a code phrase for racism. Rational beings know the main reason this war was fought. The South's intransigence was a heavy price for the nation to pay. An incredible 620,000 casualties on both sides, not counting civilian deaths. Reconstruction in the years after failed, and segregation and further murder and oppression of blacks would go on for another century. On the other hand, it propelled the country toward industrialization at light speed. America would no longer be an agrarian society. It sowed the seeds for our dominance in the decades to come. I also believe, at least until the Second World War, that it cured us of being a militaristic society. We too easily forget history though. Now that the sesquicentennial is here, and I'm alive to see it, I'm going to take a closer look at at this war. I'm thinking of taking a trip down to Gettysburg and visiting the battlefield as well. The divisive nature of that point in history seems to mirror the present circumstances we find ourselves in politically. Having our first black president imbues the struggle with that much more meaning.